Liberty Home Builders is committed to environmentally responsible, resource- efficient building techniques that enhance the quality of your home and reduce your energy bills. Liberty’s Smart Home Design is specifically constructed to reduce energy consumption and cost, conserve water and natural resources, and lower pollution, waste and environmental impact. on the bottom plate and foam seal around doors, joints and windows reduces leaks, making your home more comfortable. keep solar rays out in the summer and keep heat in during the winter. minimizes waste and creates a more structurally sound home. blocks heat from entering the attic, reducing energy consumption. techniques mean reduced air leakage for more efficient cooling and heating. reduces air infiltration, making your home more comfortable and energy efficient year-round. combines the look of wood with lower maintenance and longer life. helps moderate the temperatures in the attic as well as reduce overall temperature in the rest of the home. throughout the home last longer and lower your electric bill. and a minimum 15 Seer HVAC System* mean more efficient cooling and heating. Programmable thermostat comes with every home. Engineered Foundation & Floor System minimizes waste and creates a more structurally sound home. Advanced Framing techniques mean reduced air leakage for more efficient cooling and heating. Fiber Cement Siding & Soffit combines the look of wood with lower maintenance and longer life. Radiant Barrier Roof Decking blocks heat from entering the attic, reducing energy consumption. Low VOC Carpet & Water-Based Paints ensure healthy air quality inside your home. LED Lights throughout the home last longer and lower your electric bill. Attic and Wall Insulation reduces air infiltration, making your home more comfortable and energy efficient year-round. Poly Seal Caulking on the bottom plate and foam seal around doors, joints and windows reduces leaks, making your home more comfortable. Insulated & Mylar Wrapped A/C Ducts and a minimum 15 Seer HVAC System* mean more efficient cooling and heating. Programmable thermostat comes with every home. Attic Ventilation helps moderate the temperatures in the attic as well as reduce overall temperature in the rest of the home. Wi-Fi Access Point Pre-Wiring: Whether streaming, surfing, shopping or gaming, enjoy reliable Wi-Fi in every room of your home! Gas Water Heaters are far more efficient than electric, saving you money year after year. Independent Third Party verifies all components and energy efficiency at framing and once again at home completion. * The information contained herein is subject to change without notice. The accuracy of the information is to the best of our knowledge at the time this brochure was created. All numbers and percentages are approximate and based on several factors such as utility rate, energy consumption and weather conditions. 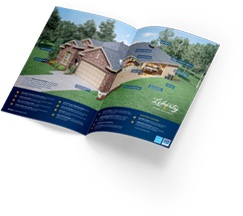 Ask a Liberty Home Builders sales counselor for more information.